While most couples tend to meet up with friends at a local bar or restaurant, Jeff Waldman and his partner, Molly Fiffer, decided they wanted to create a more nature-based social spot to spend time with their friends. So, the ambitious couple, who have no design or construction experience, spent more than two years creating an amazing DIY outdoor retreat tucked into a heavily forested 10-acre lot deep in California’s Santa Cruz Mountains. 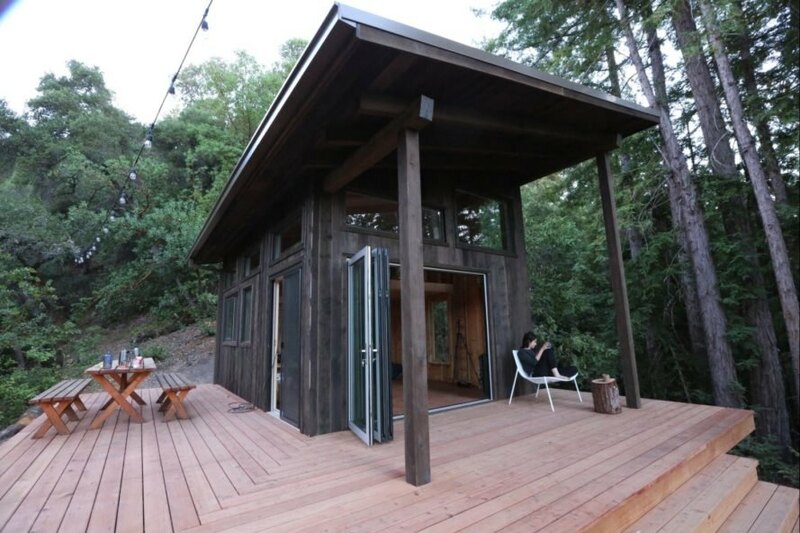 What began as a simple structure to enjoy the outdoors has resulted in not only a beautiful off-grid cabin made out of reclaimed wood, but a series of elevated tree decks, a wood-fired hot tub, an open-air outdoor shower, and the cutest little outhouse you’ve ever seen. 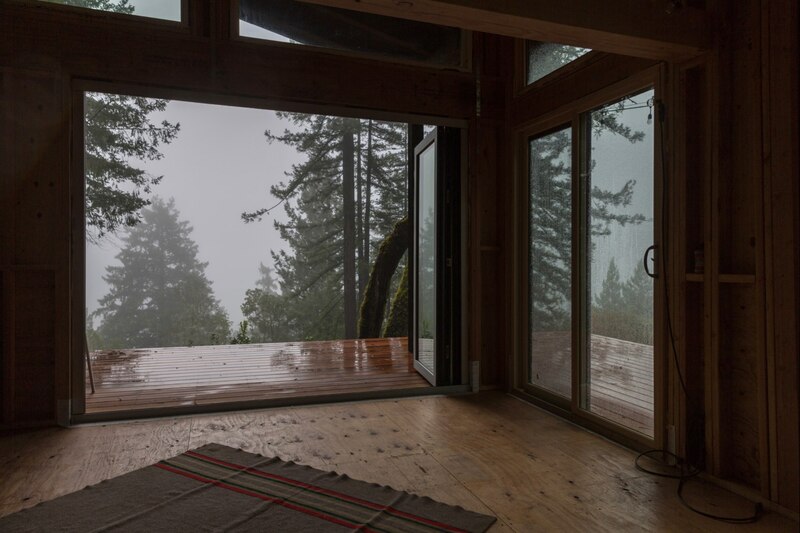 The cabin was inspired by Waldman and Fiffer’s vision of building a serene place where they and their friends could get away from the hustle and bustle of daily life in order to reconnect with nature. 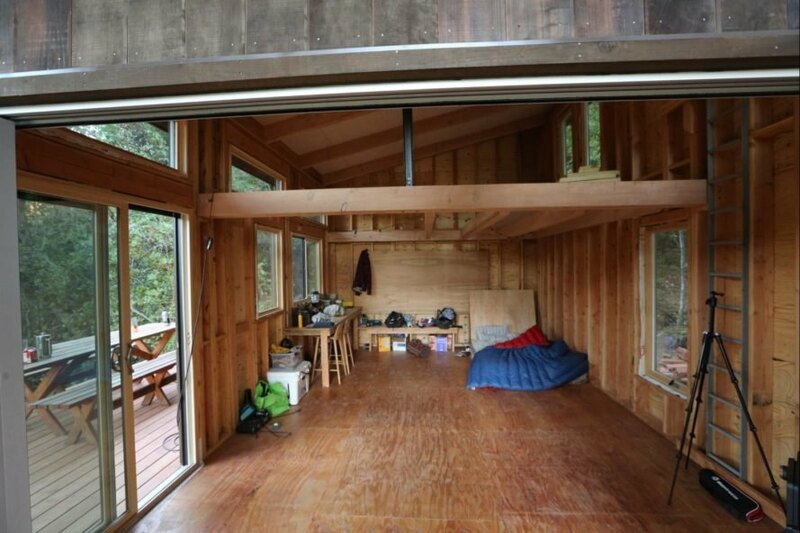 Once they found the perfect spot in the forest, the couple then went about salvaging building materials, including a large front door and most of the windows. The ambitious couple did most of the work themselves, with the help of friends, without having any prior design or building experience. The result is a stunning retreat comprised of the wooden cabin, winding elevated decks suspended from the trees, an outdoor shower and what very well could be the coolest outhouse on earth. The main cabin is at the heart of the impressive forest retreat. Using a salvaged front door and windows to guide the construction, the wooden cabin design morphed into a beautiful structure with a sloped roof. Set off the ground to reduce impact on the landscape, the cabin includes a large open living space and a sleeping loft. Large windows flood the interior with natural light and a wrap-around wooden deck is perfect for gatherings or just soaking up the incredible views. In line with the group’s dedication to protect the existing trees, they decided to add a series of suspended decks to the design. Anchored into the tree tops, the decks are 15-20 feet high and are accessed via a 20-foot long bridge. This low-impact construction allowed the group to build a series of interconnecting surfaces without disrupting the landscape. 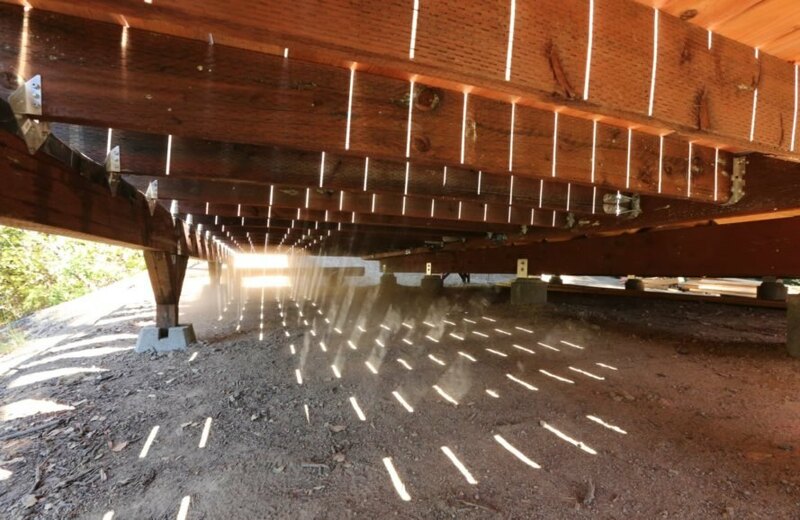 Although the suspended decks are incredible for strolling through the tree canopy, there are also a few surprises along the way. 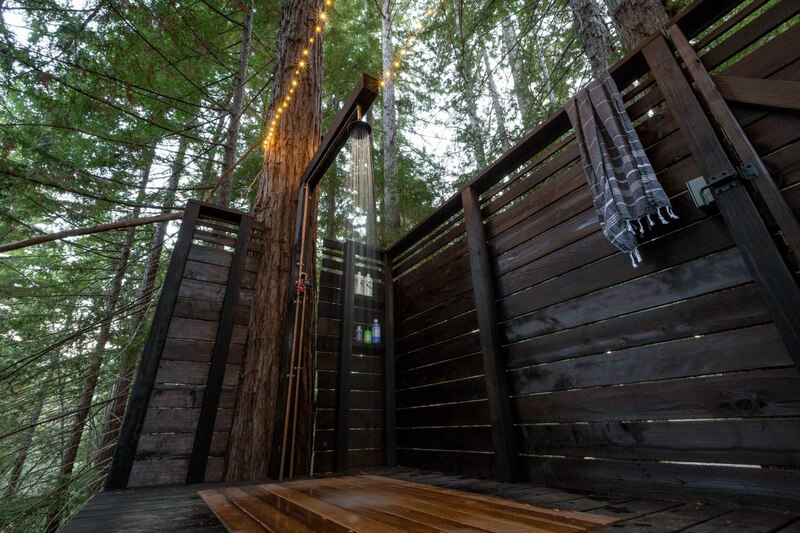 A lovely outdoor shower sits approximately 10 feet off the ground. The shower, which is left completely open on one side, is heated via an off grid heater and has solar-powered lights. 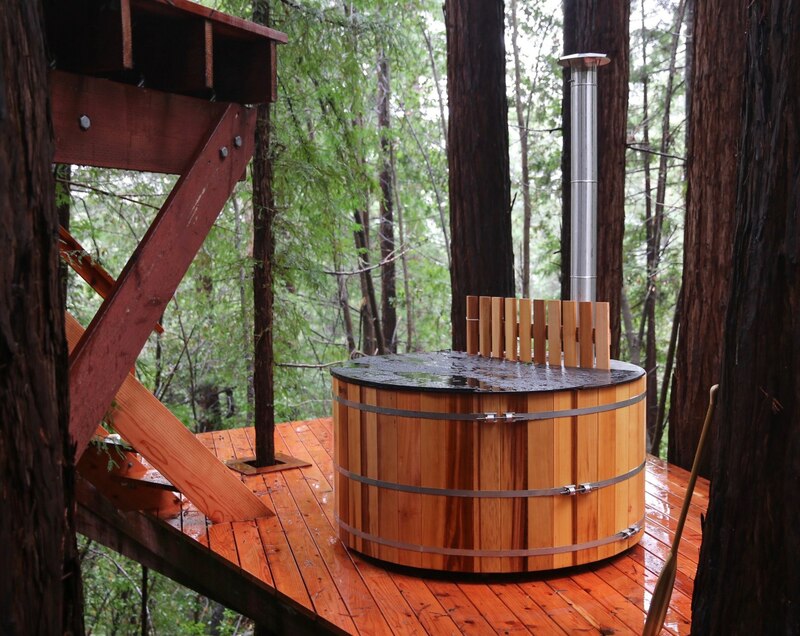 Also on one of the platforms is a wood-fired hot tub that is heated with leftover scraps from the cabin build. 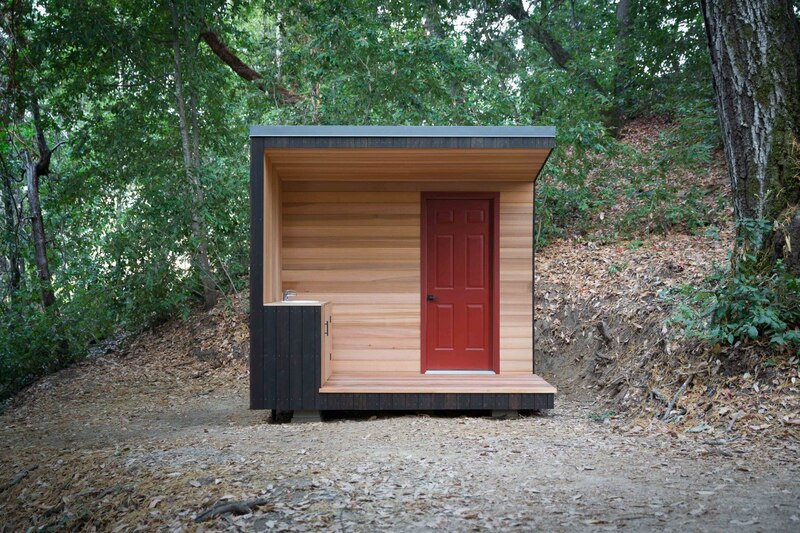 Located 100 feet behind the cabin is a 10 x 10 outhouse, set off the landscape with blocks. The incredible cube-like structure has a surprisingly contemporary aesthetic. The entrance is an open air deck with an outdoor sink that was reclaimed from the local rebuilding center. 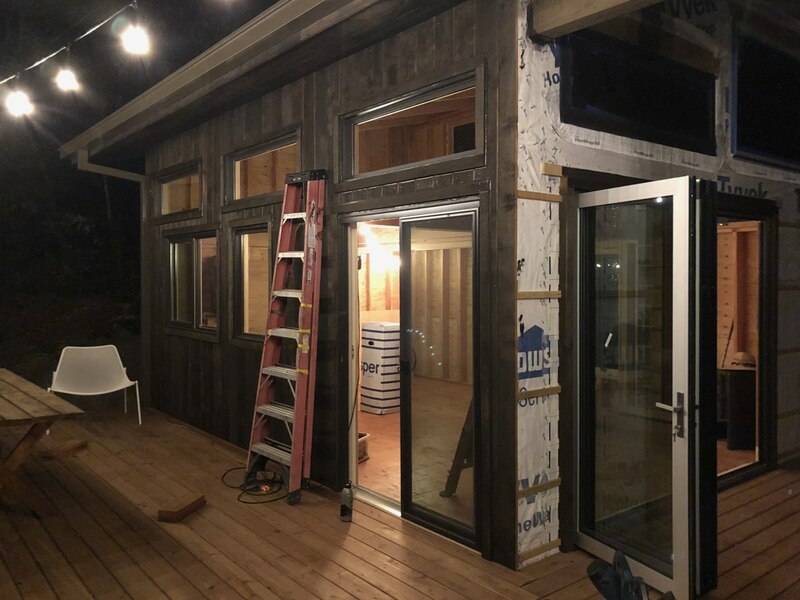 The exterior cedar siding, which was bought on Craigslist, has been treated with Scandinavian pine tar to achieve the jet black color and protect the exterior against the damp coastal climate. The interior, which is clad in black bear wallpaper, is installed with a solar-powered fan and lights. Also on site is the Dojo, which houses an open air kitchen that operates with a propane stove and is also installed with a solar-powered lighting system. The structure is covered with a grey tinted polycarbonate roof to allow natural diffused sunlight through to the interior space. Although it looks like heaven on earth already, Waldman says that the cabin retreat is a work in progress. When not having ax throwing or archery competitions, the group is making plans to build a guest hut and treehouse. 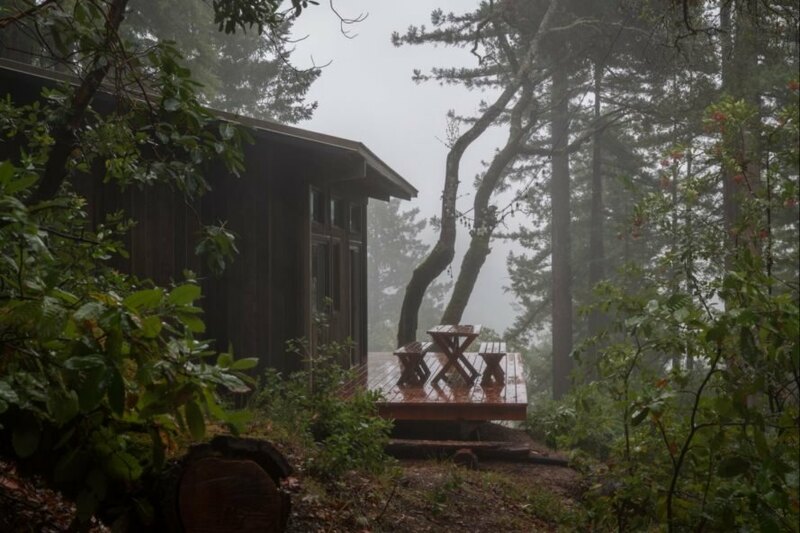 The wooden cabin is located on a 10 acres lot filled with beautiful redwoods. 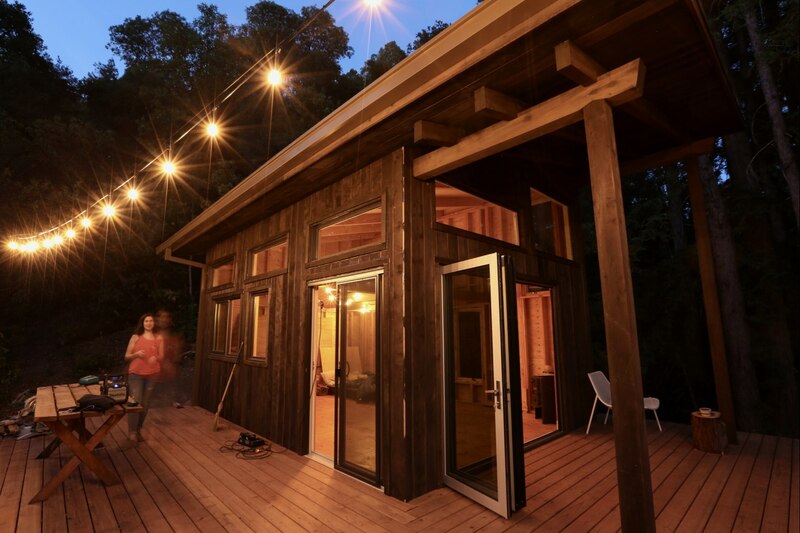 The cabin's lighting system is powered by solar energy. 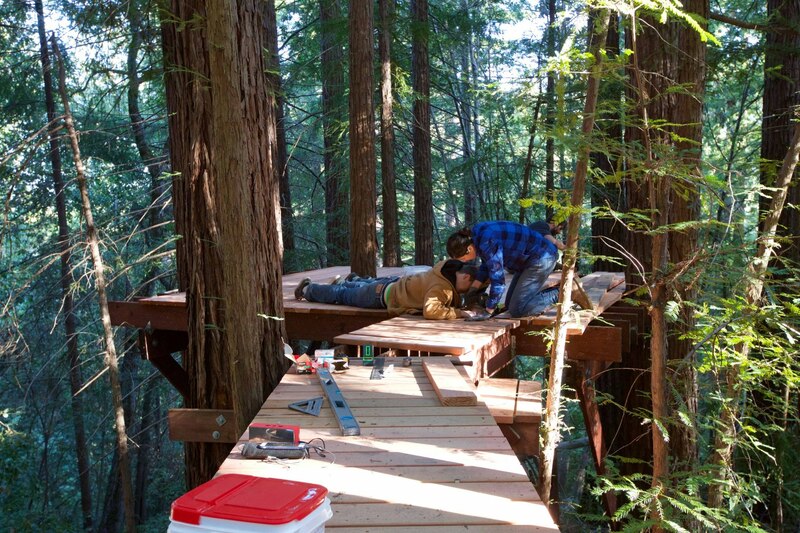 Jeff Waldman and Molly Fiffer built the cabin with reclaimed wood. The couple used reclaimed windows in the design. The abundance of windows floods the interior with natural light. 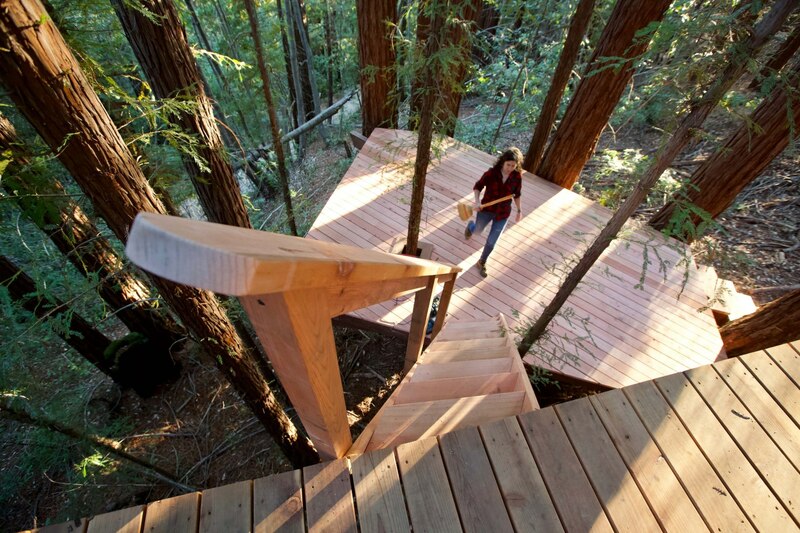 The cabin retreat comes with a series of suspended tree decks. An outdoor shower was installed on one of the decks. The shower is installed with solar powered lights. The hot tub is powered by wood scraps leftover from the design. The cube-like outhouse is a serene structure. The outhouse has an interior with cedar flooring and modern wallpaper. 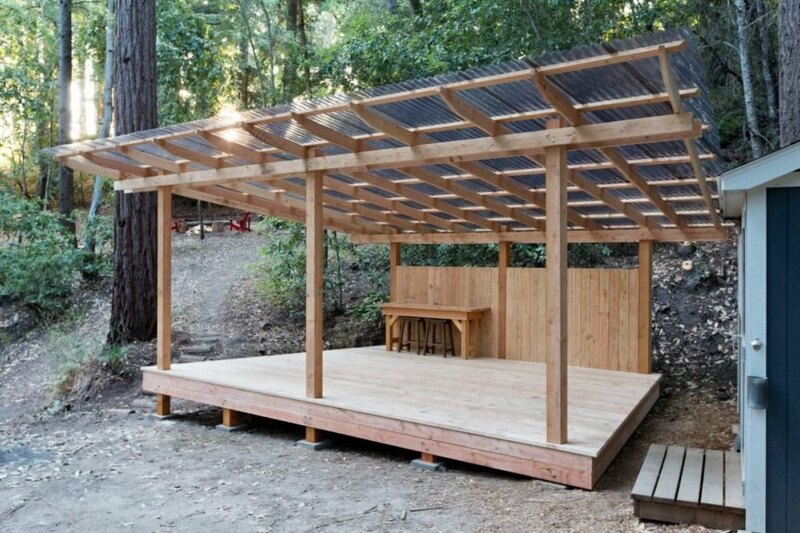 The Dojo is an open-air space for preparing meals. A series of platforms and bridges winds around the campsite. The group was able to anchor the platforms into the trees. The buildings are all lifted off the landscape to reduce impact. Jeff and Molly built the camp for their friends. The DIY cabin took about 2 years to build. The interior of the cabin is light and airy. 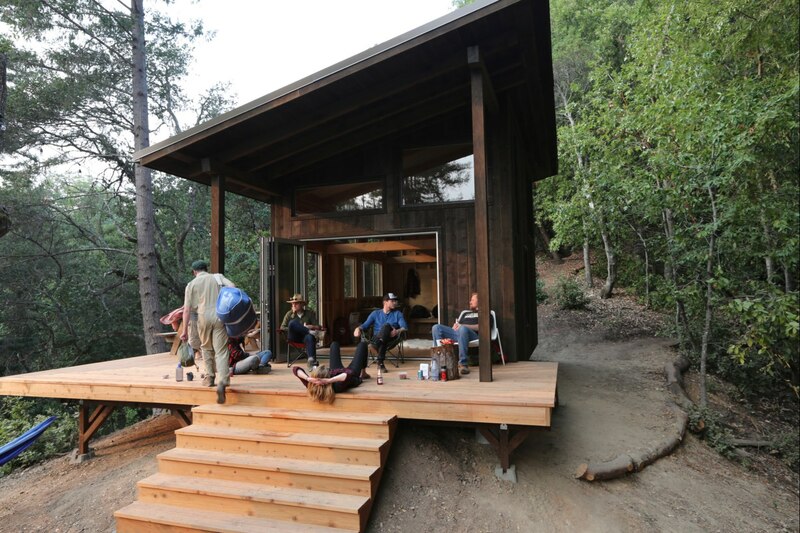 The cabin is the social heart of the project. The cabin sits on 10 acres of forested land. 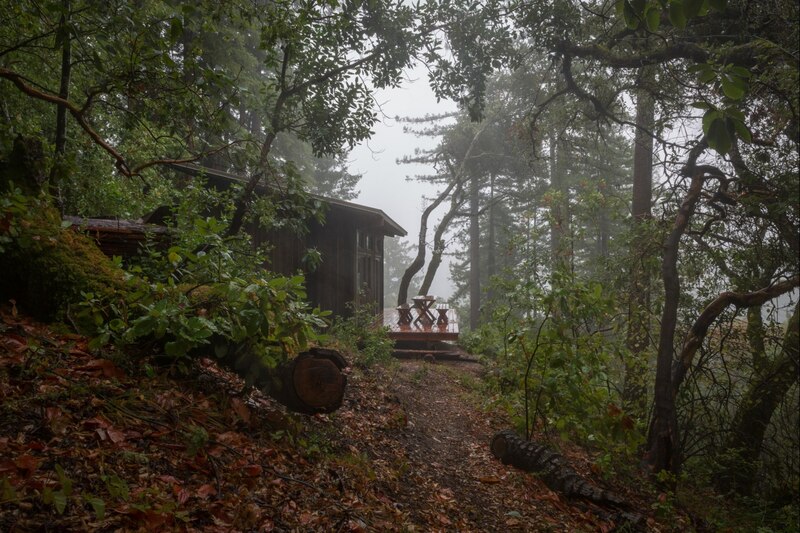 The cabin is located deep in the Santa Cruz mountains. The project focused on retaining the existing trees on site. The elevated decks add a whimsical nature to the design.